Tour Rose Hall Great House and keep your eyes open for ghosts! Sightsee in downtown Montego Bay, glide through the waters of the Luminous Lagoon and explore Rose Hall Great House. During this Jamaica Super Saver tour led by an expert guide, visit attractions like the St James Museum Sam Sharpe Square. At Rose Hall, a stately historical mansion, learn the scandalous story of the house's ghostly past. Hop on a boat to float on the glowing waters of the Luminous Lagoon to finish off your evening, jumping in for a luminous swim if you're brave. Round-trip transportation from Montego Bay, Grand Palladium and Negril hotels is included. Following pickup in Negril, Montego Bay or at the Grand Palladium Resort in Lucea, board your comfortable vehicle for the trip to downtown Montego Bay. If you're picked up in Lucea or Negril, enjoy your relaxing ride down the scenic Jamaican coastline on the way into town. When you disembark in Montego Bay, follow your guide on a 1-hour sightseeing tour that takes you through the city highlights. Drive by Sam Sharpe Square, named after the slave who led the 19th-century Christmas Slave Rebellion, view the neighborhood's blocks of impressive colonial buildings and learn about Jamaican history from your guide. You'll then drive through some of the residential neighborhoods featuring stately Georgian homes funded with money from the island's once-thriving sugar trade. View St James Parish Church, the home of stained glass pieces by English sculptor John Bacon. At the conclusion of your tour, spend about 45 minutes perusing Rainbow, a local shop selling local Jamaican goods like coffee, rum and jerk seasoning. Pop out to a local restaurant for dinner (own expense), before continuing on to Rose Hall. Rose Hall Great House is known for the legend of the 'White Witch of Rose Hall', about a woman named Annie Palmer who killed her three husbands and several slave lovers before taking her own life. Follow your guide on a 1-hour tour through the graceful Georgian mansion, full of historical artifacts. Back on the coach, travel 30 minutes to the Luminous Lagoon, one of Jamaica's most famous attractions. Climb aboard a boat to see this eerie body of water up close. Learn about the harmless microorganisms that cause the glowing phenomenon. 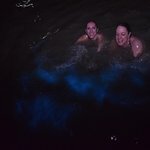 If it's a warm night and you're adventurous, take a break from the 30-minute boat ride with a swim in the fluorescent waters. When you return to shore, you’ll head back to Montego Bay, Grand Palladium or Negril for hotel drop-off. During the drive back to Grand Palladium and Negril, a stop is made to purchase food and drinks (own expense). We enjoyed all of the stops on our tour. It was a great value based upon the prices of individual outings that I had previously priced out. Nice evening outing for the price. Get quick answers from Jamaica Super Saver: Montego Bay and Rose Hall Tour plus Luminous Lagoon Night Cruise staff and past visitors.